It is important to make sure you correctly store your dog’s food. Improperly stored food can go rancid, develop bacteria or mold, become infested with insects or rodents. 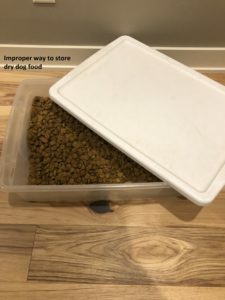 I am going to discuss how to store dry dog food to help keep it fresh and also discuss the best dog food storage containers that will help prolong the freshness of your dog’s food. Dog food is expensive, and the last thing that you want to do is toss out the food because of improper storage. Air – Exposure to air means exposure to bacteria. It is best to store dry dog food in an airtight container. Moisture – Can lead to mold. Never store dry dog food under a sink or anywhere it can get wet. High Temperatures – Heat and humidity will speed up the rate which food will degrade. Don’t store dry dog food in a garage or shed or anywhere temperatures can go above 100 degrees F. Dry dog food needs to be stored in a cool dry place. The #1 best thing you can do for your dry dog food storage is to keep it in the original bag that you purchased the food in. There are special liners within the dog food bag that are designed to retain important fat content as well as flavor. The oils from the fat that are released outside of the bag run the risk of becoming rancid. All dog food should have a “best by” or “best before” date printed somewhere on the bag. Keep an eye on these dates to get the freshest food. I would consider that once you open the bag of dog food, the date is no longer valid. Opened bags have a shelf life of 45 days and shorter if you don’t keep it airtight. Purchase an appropriate size bag to avoid dog food from going bad. Store in a cool dry place. The best place is probably in a kitchen pantry if your have one or a kitchen closet. Store out of sunlight. The sunlight can increase the temperature and the humidity, which will speed up the rate of spoiled food. Store dry dog food off of the floor. Storing on the floor will run the risk of your dog being able to get into the dog food and overeating. If your dog gets into the bag of dog food, they could eat too much and run the risk of getting dog bloat. Keep the bag as airtight as possible. This is where it is beneficially to have a storage container for your dry dog food. I recommend using an airtight storage container that you can place the entire bag of dog food in the container while it is still is in its original bag. It will offer you the benefit of what the bag provides for keeping your dog food safe and also keep the dry dog food fresh from the airtight container. 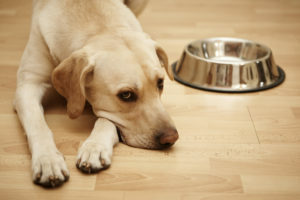 Dry dog food can be left in your dog’s bowl for about a day before going bad. Wash your dog’s bowls at least once a week in hot soapy water. The oils and fat from the food that remain on the bowl can become rancid. Since exposure to air, light, hot temperatures and humidity can all speed up the rate at which food will degrade, I do suggest storing dry dog food in an airtight storage container. They are going to protect the dog food from the elements and insects, and at the same time keep your dog from helping themselves to a little extra. Purchase a storage container that is large enough to fit the entire bag of dog food in the container, leaving the dog food in the original bag. As I mention above, there are benefits to keeping food in the original bag, but the original bag isn’t airtight. Keeping the original bag with also be beneficial if there is every a recall, with all the information on the bag that you would need. Never use generic plastic bins to store dry dog food in. They contain microscopic pores in the surface where fats and oils can settle. When they oxidize, they get rancid and can create an area of mold that is too small to see. Only use plastic dog food storage containers that are specially designed to be safe. Stainless steel containers will help retain nutrients without altering the flavor. Below are my recommendations for the best dry dog food storage containers. Having an airtight container will help keep your dog’s food fresh and will be healthier for your dog. This one is a beauty and will look good wherever you place it. Brushed stainless steel which is fingerprint proof to always look its best. Lock-tight handle. Ergonomic handle locks the lid shut to help prevent dogs from opening the lid and forms an airtight seal to keep food fresh. Available in 3 sizes. 27 pound bag of food, 32 pound bag of food or 40 pound bag of food. Choose the size that fits your dog. Lid mounted scoop. Scoop conveniently attaches neatly under the lid. Built-in wheels. Makes it easy to move around. Silicone gasket forms an airtight seal. This dog food container is plastic, but it is plastic that is safe to store food in. A great feature of this container is that it can be stackable, which helps if you have multiple animals with different food. It will save on space. Airtight seal keeps food fresh. Available in 40 pound size and also 60 pound size. Crafted from food-grade, BPA-free HDPE plastic, which is completely safe to store food in. Easy care. Thoroughly wash and dry regularly. This container has a cute paw print on it, but they have different designs available. Flat backed design to sit flush against the wall. BPA-free polypropylene plastic that is completely safe for storing food in. Moves easily on 4 rolling casters. Includes 1 cup measuring scoop that locks into the lid. Available in 26 pounds storage. 15.5″ long, 13.25″ wide and 16.75″ high. This one is a bit different from the others. It does not have an airtight storage for your dog food, but it has a storage area for the food with pull out bowls below. It is more like a piece of furniture for your home. If you are interested in this, you would still want to make sure you figure a way to keep your dog food sealed airtight. Food storage area and pull out bowl. Constructed of engineered wood and solid wood. Pull out tray with inset stainless steel food and water bowls. Fits 33 pounds of food. 24″ wide, 14″ deep, 32″ high. This does require assembly, and some people have mentioned that it can be a bit difficult to put together, but I do not know their skill abilities. It is important to remember that air, heat, light and humidity can all have an effect on maintaining the freshness of your dog’s dry food. How to store dry dog food is by keeping it in the original bag, in a cool area and keeping the bag airtight. This will help the shelf life of your dog food, and will also help you provide your dog with the freshest food to help keep them healthy. Remember to wash your dog’s bowls at least once a week with soapy water, and also wash your storage container when you change out the bag of food. Don’t use any plastic storage containers that you have available to store your dog food. They might not be airtight, and chances are they aren’t made of plastic that is safe for food storage. I have provided you with several good dry dog food storage containers that should get you on track for providing you with the best way to store your dog food that will keep your dog healthy. If you have any questions, comments or suggestions, please leave them below. 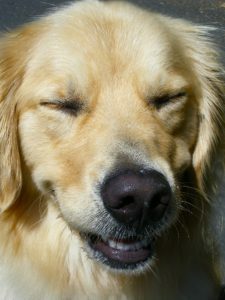 You can follow justforyourdog.com on Pinterest, FaceBook or Twitter. Hey! this is really a great article! You have provided a lot of useful information and enough for every dog owner. You really did a wonderful job creating awareness. I like the design of the website. I don’t have a dog but I really got some knowledge about and maybe it could be of some help if I get one in the future! thank you! best of luck for your future! Thank you for reading. If you have friends or family that have dogs, please pass the information along to them. It can help keep their dogs healthy longer. I would have to say that I am one of those that have not paid proper attention to the way I store my dog’s food which is why I am glad to be reading this post as it has enabled me to be able to know how to store my dog’s dry foods to prevent it from going bad. When I buy food for the dog I always make the mistake of throwing away the original packaging and this is not really the best thing to do because the original packaging contains several useful pieces of information like expiration date of the dog’s food. From the information provided in this post, these are ways ideal to store dry foods meant for dogs. Can these also be used for food items that are not dry or are they strictly meant for dry food items? I also have not previously properly stored my dog’s food. When I had a dog that got cancer, there are many different things that I starting searching, trying to figure out if there were things that I should have done differently. That is what lead me to finding out I was completely storing my dog’s dry dog food incorrectly. I was doing everything wrong with the food storage. I have since changed how I store my dog’s dry food, since keeping him healthy is very important to me. Thanks for reading my article, and I’m glad it provided you with some benefits. Thanks for reading Victor. 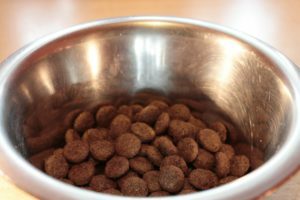 It can be challenging if your dog doesn’t go through their food quickly. I recommend buying smaller bags of food to help keep it the freshest and incorporating an airtight storage container to help keep your dog’s food fresh.